Gill is a Radiographer specialising in medical ultrasound and joined City University London in 1999. She previously worked as a superintendent Sonographer in the NHS and private practice in Hertfordshire. 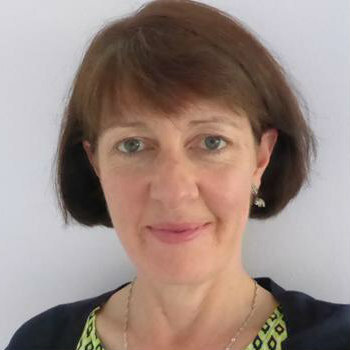 She is currently the Programme Director for the Medical Ultrasound programmes at City University London and continues to practice within the NHS. Gill started her career as a Radiographer in Lancashire, before moving to Hertfordshire and training in Medical Ultrasound. After moving into education she has continued working as a Sonographer in the NHS and private practice. She has taken an active role in professional accredition of ultrasound programmes, as a lead accreditor for CASE (The Consortium for the Accreditation of Sonographic Education) and developing clinical competency guidelines in addition to training accreditors. She has a keen interest in teaching ergonomics in ultrasound and breaking bad news to ultrasound and medical students and developing clinical teaching skills for ultrasound supervisors and mentors. She has also introduced a number of innovative teaching, learning and assessment methods to the ultrasound programme. Gill has been involved in ultrasound education in Uganda, on behalf of the British Medical Ultrasound Society. - June 2008 - Learning and Teaching award for curriculum development by the Centre for Educational & Academic Practice, City University London. As part of the development of innovative teaching, learning and assessment methods, Gill is keen to assess students' experiences using these interactive methods. - 2009 - £15K CETL funded project to develop on-line resource to enhance feedback in clinical and communication skills. Harrison, G. (2015). Ultrasound clinical progress monitoring: Who, where and how? Ultrasound, 23(4), pp. 197–203. doi:10.1177/1742271X15600006 . Parker, P.C. and Harrison, G. (2015). Educating the future sonographic workforce: membership survey report from the British Medical Ultrasound Society. Ultrasound, 23(4), pp. 231–241. doi:10.1177/1742271X15605344 . Harrison, G. (2015). Summative clinical competency assessment: A survey of ultrasound practitioners’ views. Ultrasound, 23(1), pp. 11–17. doi:10.1177/1742271X14550238 . Williams, C.J., Edie, J.C., Mulloy, B., Flinton, D.M. and Harrison, G. (2013). Transvaginal ultrasound simulation and its effect on trainee confidence levels: A replacement for initial clinical training? Ultrasound, 21(2), pp. 50–56. doi:10.1177/1742271X13481215 . Harrison, G., Hayden, S., Cook, V. and Cushing, A. (2012). Improving health care professionals' feedback on communication skills: Development of an on-line resource. Patient Education and Counseling, 88(3), pp. 414–419. doi:10.1016/j.pec.2012.06.025 . Harrison, G. (2018). Reporting Sonographers: Education for the future. NHS Benchmarking 20 September, London. Harrison, G. (2016). Harrison G. Test: Image Interpretation - Obstetric Ultrasound: Introduction. Image Interpretation. HEE e-learning for Healthcare. 2016. Health Education England. Harrison, G. (2013). Image Interpretation - Obstetric Ultrasound: Nuchal Translucency. e-learning for healthcare / Health Education England. Harrison, G. (2018). Sonographer Workforce Developments. Synergy News pp. 12–13. Harrison, G., Harris, A. and Flinton, D. (2018). Can teaching ultrasound ergonomics to ultrasound practitioners reduce white knuckles and transducer grip force? Journal of Diagnostic Medical Sonography. doi:10.1177/8756479318758324 . Hawkes, R.A., Patterson, A.J., Priest, A.N., Harrison, G., Hunter, S., Pinney, J. … Lomas, D.J. (2016). Uterine artery pulsatility and resistivity indices in pregnancy: Comparison of MRI and Doppler US. Placenta, 43, pp. 35–40. doi:10.1016/j.placenta.2016.04.002 . Stoyles, T. and Harrison, G. (2006). A National Survey of Sonographers and their reporting Practices in the General Medical Ultrasound Field. Ultrasound, 14(2), pp. 109–114. doi:10.1179/174313406X93595 . Harrison, G. and Mitcalf, R. (2003). Trends in Litigation Activity against Sonographers. BMUS Bulletin, 11(1), pp. 33–36. Harrison, G. (2002). Knowledge of Clinical Governance. A Pilot study. . Journal of Diagnostic Radiography, 4(3), pp. 127–133. Easen, S. and Harrison, G. Communication skills training in ultrasound: Ultrasound practitioners’ views. Imaging Therapy and Practice pp. 30–35. Gibbs, V., Edwards, H. and Harrison, G. Independent reporting sonographers-could other countries follow the UK's lead 2017. Imaging & Therapy Practice, November, pp. 25–29. Neale, E., Chudleigh, T., Harrison, G., Nelder, J. and Baker, R. Cervical length assessment: How accurate are sonographers? 21st World Congress on Ultrasound in Obstetrics and Gynecology, Los Angeles. 18 – 22nd September 2011., 2011. Neale, E., Chudleigh, T., Harrison, G., Nelder, J. and Baker, R. What are the pitfalls of cervical length assessment? 21st World Congress on Ultrasound in Obstetrics and Gynecology, Los Angeles., 2011. Cook, V., Cushing, C., Goreham, C., Harrison, G., Hayden, S., Perovic, N. … Rogers, M. Learning to give feedback : using filmed vignettes to promote effective practice. 1st International Conference on Faculty Development in the Health Professions. Toronto, Canada, 2011. Learning to give feedback : using filmed vignettes to promote effective practice. Council of Clinical Communication Conference. Manchester, 2011. Cook, V., Cushing, A., Goreham, C., Harrison, G., Hayden, S., Perovic, N. … Rogers, M. Cook V, Cushing AM, Goreham C, Harrison G, Hayden SM, Perovic N, Rogers M. (2011) Learning to give feedback : using filmed vignettes to promote effective practice. Academy of Medical Educators 3rd Annual Academic Meeting, Grosvenor Square, London, 2011. Harrison, G. On-Line Case Discussions: Innovation? British Medical Ultrasound Society 42nd Annual Scientific Meeting, 2010. Cook, V., Cushing, A., Goreham, C., Harrison, G., Hayden, S., Perovic, N. … Rogers, M. Cook V, Cushing A, Goreham C, Harrison G, Hayden S, Perovic N and Rogers M (2010) Learning to give feedback : using filmed vignettes to promote effective practice. Poster Presentation. Association for Medical Education in Europe Conference. Glasgow, 2010. Co-managed the obstetric module development for the DoH / SCoR e-learning for health (e-LfH) project.. Associate Editor for the journal Ultrasound..
British Medical Ultrasound Society 50th Annual Scientific Meeting. (Conference) Manchester (2018). Invited speaker. Paper: What makes a good ultrasound placement? Past, present & future. Description: Clinical placements are one of the most important aspects of good ultrasound education. Without a good placement, ultrasound practitioners will be unable to develop necessary skills and competence to become safe, effective sonographers. The development of a wide range of skills takes place in the clinical setting, with practice educators supporting students to link theory to practice, ‘drive’ the machine; undertake, interpret, analyse and report ultrasound scan findings within their scope of practice; communicate unexpected findings and reflect on their practice. This presentation will focus on the traditional ultrasound pathways (post graduate ultrasound education for health care professionals), to explore the past methods of educating sonographers in the clinical department, the current clinical training methods and consider some potential developments that might be needed to assist in the future. It will be an attempt to provide a nostalgic glimpse of the ‘good old days’, a critique of present day challenges and a hunt for the crystal ball to gaze into the future. Paper: Training capacity: Challenges and solutions. Description: The demand for ultrasound, along with other imaging investigations is increasing year on year (NHS England 2014), requiring an increasing number of ultrasound practitioners to provide the service. This demand, coupled with sonographer shortages (CfWI 2017), is putting a strain on clinical departments. It is clear that change is needed to facilitate good quality clinical education for sonographers and other health care professionals who need to learn the art of ultrasound scanning as part of their clinical role. Health Education England (HEE) are working with key stakeholders, including clinical staff, educational institutions, the British Medical Ultrasound Society (BMUS), the Society and College of Radiographers (SCoR), the Royal College of Radiologists (RCR) and the Chartered Society of Physiotherapy (CSP) to review current clinical educational models and consider innovations to help resolve some of the current challenges. During the presentation some of the current challenges will be discussed, along with findings from the HEE sonographer training group (STG) survey of clinical managers and discussions with education providers. A number of innovative solutions will be introduced and an update on the latest STG developments will be shared. Achieving Excellence in Radiography Education and Research. (Conference) Leeds (2018). Introduction: Sonography is a shortage occupation1, with evidence suggesting vacancies rates of between 5 to 25% in England and an increasing demand for ultrasound examinations.2 Ultrasound education is changing to meet service needs3, however one challenge being faced by education providers and clinical staff is the lack of clinical placement capacity4. Method: An on-line survey was sent to ultrasound managers to investigate innovations being used to increase clinical capacity for educating sonographers. Higher education providers were also contacted via email and telephone for their views on innovations in ultrasound clinical education. Additional objectives of the study included determining current and future estimated sonographer shortages and placement capacity. Results: There were 72 responses to the questionnaire. The average shortfall in sonographers was 2.65, with 5% of departments reporting a deficit of 10 sonographers. The predicted number of additional sonographers required to provide the service in five years’ time was an average of 4.6 sonographers, with 10% of departments anticipating they will need an additional 10 sonographers. Most departments were involved in clinical ultrasound education, with 51% of students being sonographers, averaging two per department. Several departments had additional capacity for teaching students, with a combined total of 45 places. A number of challenges were raised by respondents, particularly relating to issues of funding for student sonographers, balancing clinical and teaching requirements, staff shortages and the need to teach others, e.g. radiologists because of radiology shortages. Discussion and conclusion: A number of different methods are being used to extend the capacity for clinical education of sonographers, these include extended working days and weekend teaching lists, simulation and peripatetic clinical educators. As ultrasound education is undergoing changes, to meet the increasing service needs, innovative solutions to increase placement capacity are needed. This study provides some ideas to assist education providers, clinical departments and stakeholders to meet these demands. 3. The Consortium for the Accreditation of Sonographic Education (CASE). ‘Assertions of the Standards to be met within through Sonographic Education,’ 2018. [Unpublished, in draft]. Empathy and compassion are deemed to be important skills needed for working in the healthcare setting. Sonographers are expected to deliver difficult news to patients, often under challenging circumstances, without warning and in some cases when unsure of the actual diagnosis1. This study aims to assess medical ultrasound students’ opinions of a new interactive service user and carers session, which was introduced to the programme in June 2017. It also investigated whether empathy scores2 changed in response to the interaction with service users. Students were invited to participate in the study by completing the Toronto Empathy Questionnaire2 before and after the service user session. Students and service users also completed a short questionnaire at the end of the session, for evaluation and to provide suggestions for future iterations. Students were asked to reflect on what they had learnt and how it might impact on their practice. Twenty three students (48%) participated in the study at a single institution across two cohorts. Twenty empathy scores were valid. In the first cohort average empathy scores increased from 48.1 to 51.9 with 80% of students showing increased empathy score, whereas the second cohort average empathy scores remained the same pre and post session at 51.3, with 40% increasing, 40% reducing and 20% remaining the same after the session. The event met or exceeded students’ expectations, despite one student thinking they would not ‘get anything out of it’. Students valued the ‘candid and frank’ exchange with service users. Empathy levels increased or remained the same for three quarters of students, although the mean empathy scores for both male and female students was higher than published norms (44.5 – 47)2 before and after the session. Empathy can lead to improved trust between health care provider and patient, compliance with instructions and treatment, patient satisfaction and outcomes.3,4,5 Various ways to change practice in light of this session, which would impact on patient care and communication, were highlighted. 1. Eason, S. and Harrison, G. (2017) Communication skills training in ultrasound: Ultrasound practitioners’ views. Imaging & Therapy Practice. January, pp. 25-30. 3. Kelm, Z. Womer, J. Walter, J. and Feudtner, C. (2014) ‘Interventions to cultivate physician empathy: a systematic review’, BMC Medical Education, 14 (1), pp. 219-219. 4. Riess, H. (2017) ‘The science of empathy’ Journal of Patient Experience, 4 (2), pp. 74-77. 5. Bell, H. 2018, "Creative Interventions for Teaching Empathy in the Counseling Classroom", Journal of Creativity in Mental Health, vol. 13, no. 1, pp. 106. European Congress of Radiology. (Conference) Vienna. (2017). Invited speaker. Medico-legal issues in ultrasound reporting. Bristol (2016). Audit in Action. City University London (2016). Games with Aims. London (2016). Postgraduate Ultrasound Programme: We’ve flipped, have you? Glasgow (2016). CASE accreditors’ experience of accrediting a new direct entry programme. London (2015). Description: CASE accreditor training day. Simulation in Medical Ultrasound. Brighton (2015). Association of Simulated Practice in Healthcare (ASPiH) Conference. (invited speaker). Brighton (2015). Games with Aims. London (2015). The Flipped Classroom. We’ve flipped. Have you? London (2015). Ergonomics hand-on Workshop. British Medical Ultrasound Society 46th Annual Scientific Meeting. (2014). This workshop will provide a chance to put into practice good ergonomic practice, with a facilitator to advise on how to reduce the risk of injury. The workshop is relevant for anyone undertaking ultrasound and wanting to reduce their risk of work related injury. •	Scan in a small group setting and gain advice about posture. We’ve flipped. Have you? City University London (2014). The Flipped Classroom: New innovation or an old idea? UKRC Conference, Manchester (2014). In recent years due to technological advances, innovative curriculum design has been central to the developments within many health care education programmes. The Medical Ultrasound programme at City University London has been no exception. To enhance the face to face learning time within the part-time postgraduate programme we developed a method of blended learning, which involves on-line lectures and guided self study, supported by interactive film viewing sessions, group discussions, simulation and games within the lectures. Additionally on-line case discussions are used to share clinical cases from the clinical workplace and develop collaborative learning and assessment in the clinical modules. The term “flipped classroom” has appeared frequently in recent educational literature, this presentation will consider whether it is a new idea and how it has been used within the Post-graduate ultrasound programme. The term “flipped classroom” has appeared frequently in recent educational literature. This presentation will consider whether the post-graduate medical ultrasound programme has fully flipped, review some of the student feedback and share ideas that could be used within other programmes. The use of the “flipped classroom” in a blended learning programme: Have we flipped? Learning at City Conference London (2014). Description: Learning at City Conference: Students as Partners in Learning? How best to assess ultrasound clinical competency: The on-going dilemma. British Medical Ultrasound Society 45th Annual Scientific Meeting. Gateshead (2013). Clinical competency is an essential component of any ultrasound training programme, in order to ensure high standards of practice and patient care. The Consortium for the Accreditation of Sonographic Education (CASE) commissioned a project to devise guidelines for clinical competency assessment for CASE accredited courses, in the hope of providing a minimum standard. To inform the project work an online questionnaire was devised to ascertain the opinions of ultrasound practitioners, the results of which will be presented. An online survey was sent to all UK ultrasound programme directors and CASE council members to disseminate to their academic and clinical contacts. Opinions were sought on a range of issue relating to clinical competency monitoring and assessment. 116 responses were received from a wide range of professionals, the majority being radiographers. Most respondents were involved in training, with the majority having roles as mentors and/ or assessors. Key findings suggested that regular formative assessment should be undertaken prior to final summative assessment in the workplace, with some element of external assessment or moderation of the final assessment. The majority of respondents were in favour of a national minimum standard for clinical competency assessment, with 75% strongly agreeing that a national standard for competency assessments is preferable. Generally the ultrasound community responding to this survey were in favour of standardised clinical competency assessments, with internal progress monitoring and some external moderation of final assessments to ensure independence and consistency. Transvaginal ultrasound simulation: can it replace initial patient training for doctors? British Medical Ultrasound Society 44th Annual Scientific Meeting, Telford. (2012). Assessments: Do they assess learning outcomes. York (2012). Description: CASE Accreditor Training Day, (invited speaker). The accreditation event: roles and expectations. York (2012). Description: CASE Accreditor Training Day (invited speaker). Learning to give feedback: using filmed vignettes to promote effective practice. UKRC conference, Manchester (2012). Description: Harrison, G. Hayden, S. Cook, V. Cushing, A. Learning to give feedback: using filmed vignettes to promote effective practice. United Kingdom Radiological Congress (UKRC), Manchester. Winner of Alan Nicholson Prize for best proffered paper by a Radiographer at UKRC. Straight or spline cervical length measurement – which is most reproducible. Brighton (2011). British Medical Ultrasound Society, 43rd Annual Scientific Meeting. Cervical length assessment: How accurate are sonographers? Los Angeles (2011). Description: Neale E, Chudleigh T, Harrison G, Nelder J and Baker R, 21st World Congress on Ultrasound in Obstetrics and Gynecology, 18 - 22nd September 2011 (poster presentation). The difficulties in assessing trainees and trainer competence in ultrasound. London (2011). Description: Harrison, G. Mulhair, L., Royal College of Obstetricians & Gynaecologists (invited speaker). Learning to give feedback : using filmed vignettes to promote effective practice. Toronto, Canada (2011). Description: Cook V, Cushing A, Goreham C, Harrison G, Hayden S, Perovic N and Rogers M, 1st International Conference on Faculty Development in the Health Professions (poster presentation). Toronto, Canada. Learning to give feedback: using filmed vignettes to promote effective practice. Manchester (2011). Description: Cook V, Cushing A, Goreham C, Harrison G, Hayden S, Perovic N and Rogers M, UK Council of Clinical Communication Conference, poster presentation (prize winner). Learning to give feedback: using filmed vignettes to promote effective practice. Grosvenor Square, London (2011). Description: Cook V, Cushing AM, Goreham C, Harrison G, Hayden SM, Perovic N, Rogers M, Academy of Medical Educators 3rd Annual Academic Meeting, poster presentation, 26th & 27th January. CASE Accreditor Training: The event. University of Sheffield (2010). On-Line Case Discussions: Innovation? Brighton (2010). Description: Poster Presentation. British Medical Ultrasound Society 42nd Annual Scientific Meeting, 28th - 30th September 2010. Learning to give feedback: using filmed vignettes to promote effective practice. Glasgow (2010). Description: Cook V, Cushing A, Goreham C, Harrison G, Hayden S, Perovic N and Rogers M, poster presentation, Association for Medical Education in Europe Conference, 4th - 8th September 2010. Developing and evaluating a CETL faculty-development resource to improve formative feedback on clinical and communication skills. Queen Mary’s University London (2010). Institute of Health Sciences Education research afternoon. Enhancing Feedback in Clinical and Communications Skills: An on-line resource. City University London. (2010). The skills for Accrediting. University of West of England (2010). Description: Invited speaker CASE Accreditor training seminar. The Role of the Accreditor in CASE Accreditations. Society & College of Radiographers, London (2009). Clinical Assessment Development and Delivery from the Educationalist’s Perspective. Society & College of Radiographers, London (2009). BMUS Ultrasound Training Programme in Uganda. Society & College of Radiographers, London (2006). Description: Harrison G and Drought A (2006). Current Approaches to Supporting Radiography in Developing Countries Study Day (invited speaker). Work related musculoskeletal disorders: Can you reduce your risk? British Medical Ultrasound Society 46th Annual Scientific Meeting. Manchester (2014). 9th - 11th December 2014, Manchester (invited speaker). Standardised Clinical Competency Assessments for all: Can it Happen? Brighton (2011). Invited keynote speaker. The difficulties in assessing trainees and trainer competence in ultrasound,. London, RCOG (2011). Royal College of Obstetricians & Gynaecologists (RCOG) Train the Trainers Day. Harrison, G. Mulhair, L., Royal College of Obstetricians & Gynaecologists (invited speaker). An unexpected presentation in Chile. (2018). Consortium for the Accreditation of Sonographic Education. Chair of the Ultrasound Advisory Group for the Society and College of Radiographers. co-ordinate the accreditation or re-accreditation of ultrasound programmes in the UK. Lead a project on behalf of CASE (The Consortium for Accreditation of Sonographic Education), to develop national clinical competency guidelines.